The Sufi Teaching of An-Nafas ar-Rahmaniy is transmitted by Shaykh Abdalqadir As-Sufi in his writing, "The Way of Muhammad" which he mentions as the last doctrine that completes the creation view of the Sufis. 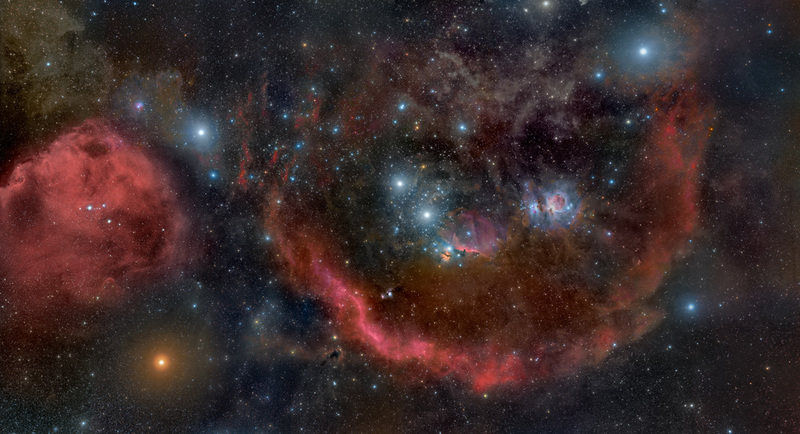 Cradled in cosmic dust and glowing hydrogen, stellar nurseries in Orion the Hunter lie at the edge of a giant molecular cloud some 1,500 light-years away. Note that this is not some magical fiat from some exterior Being. We have established that He cannot be associated with the universe of forms, and that at the same time He governs the world from the inside of the world, through the source-forms. He says 'Be' to it. It is there in the realm of source-form. It brings itself into being and actuality according to the potentiality of the locus and the source-form unity. We then say that the 'breathing out' of the Command is the coming into phenomenal reality of the thing, from the Hidden to the Manifest. It follows that the breath itself is a substance. Nature precedes what comes from her, but Nature is no other than the Breath of the Merciful. So, as the breath spreads through all the forms both physical and luminous, its life-giving, form-giving activity takes place. So everything in Nature is of the Breath, and this includes not only the physical, but the Angelic, for the creational reality is dependent on the four matrices for existence. So knowledge of the world is knowledge of this Divine Breath. The coming into existence of the Universe from non-existence into existence is an action, through the Divine Command there is a movement from repose into the activity of creation. This movement, this outflowing – we call love. This is the longing referred to by Allah-ta-'ala in the Hadith Qudsi which describes the Creation. Since the movement is love itself, the world also loves to regard itself in existence, for its very existence is a love activity. Now just to make more vivid in our minds what this activity is – and also to establish the truth of what is being described, let us look at how the nuclear physicists themselves regard the process of existence within the disciplines and limits of their science. Again, this is not to 'prove' anything – Wisdom-teaching has no proofs but experience – but simply to clarify what is being said by the vividness of the physicists' grasp of the baffling nature of the creational process. The 'restlessness' of matter implied by the uncertainty principle is a fundamental feature of the atomic and subatomic world. In this world, matter is never completely quiescent, but always in a state of motion. The molecules in solids move and vibrate due to their thermal energy. The nuclei of the atoms inside the molecular structure vibrate because they are confined to this structure. The electrons in the atomic shells are bound to a region of similar size, but being much lighter than the nuclei they move much faster and we have seen that they achieve, in fact, enormous velocities. And finally, as we shall see, the protons and neutrons inside the nucleus are confined to an extremely small volume by the strong nuclear forces and consequently they race about with fantastic velocities. We see that modern physics pictures matter not at all as inert, but as being in a continuous dancing and vibrating motion whose rhythmic patterns are determined by the molecular, atomic and nuclear structure. "At the beginning of our century, the experimental investigation of atoms gave sensational and totally unexpected results. Far from being the hard and solid particles they were believed to be since antiquity, the atoms turned out to consist of vast regions of empty space in which extremely small particles – the electrons – moved around the nucleus. 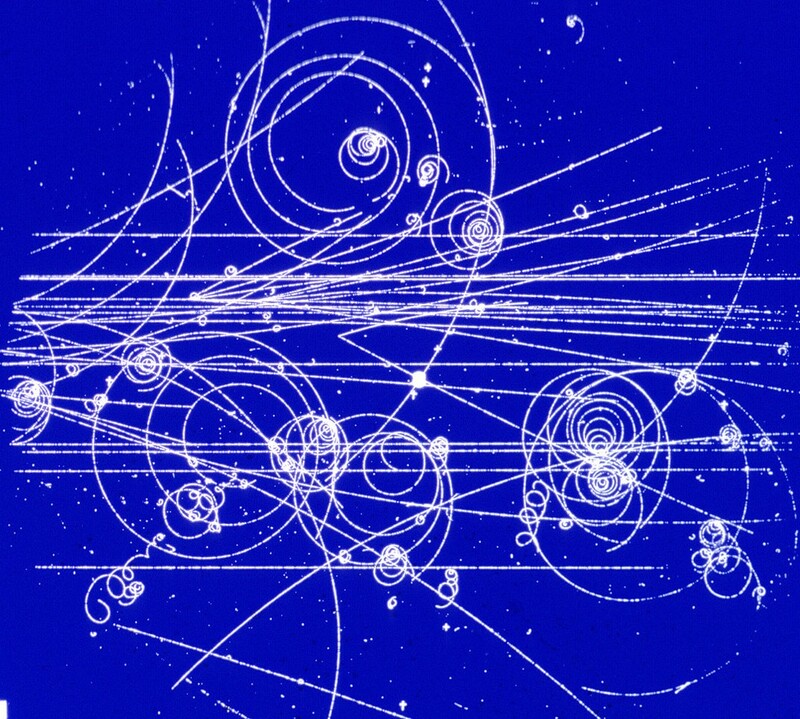 With quantum mechanics – the theoretical foundation of atomic physics – as worked out in the 1920's, it became clear that even the sub-atomic particles, i.e. the electrons and the protons and neutrons in the nucleus, were nothing like the solid objects of classical physics. The sub-atomic units of matter are very abstract entities. Depending on how we look at them, they appear sometimes as particles, sometimes as waves. This dual aspect of matter was extremely puzzling and gave rise to most of the koan-like paradoxes which led to the formulation of quantum mechanics. The picture of a wave which is always spread out in space is fundamentally different from the particle picture which implies a sharp location. The apparent contradiction between these two pictures was solved in a completely unexpected way which gave a blow to the very foundation of the mechanistic world-view, to the concept of the reality of matter. At the sub-atomic level, matter does not exist with certainty at definite places, but rather shows 'tendencies to exist'. These tendencies are expressed, in quantum mechanics, as probabilities, and the corresponding mathematical quantities take the form of waves. This is why particles can be waves at the same time. They are not 'real' three-dimensional waves like sound or water waves. They are 'probability waves', abstract mathematical quantities with all the characteristic properties of waves which are related to the probabilities of finding the particles at particular points in space and at particular times. Quantum mechanics thus reveals a basic oneness of the Universe. It shows that we cannot decompose the world into independently existing smallest units. As we penetrate into matter, nature does not show us any isolated basic building blocks, but rather appears as a complicated web of relations between the various parts of the whole, and these relations always include the observer in an essential way." Relativity theory, so to speak, has made these patterns come alive by revealing their intrinsically dynamic character. In a 'relativistic' description of the sub-nuclear world, i.e. in a description which takes relativity theory into account, space and time are fused in a four-dimensional continuum, and this means that we have to visualise the particles as four-dimensional entities in space/time. Their forms are thus forms in space and time. The particles are dynamic patterns which have a space aspect and a time aspect. Their space aspect makes them appear as objects with a certain mass, their time aspect makes them appear as processes involving a certain energy, and the two are related by Einstein's famous equation E=mc2. Relativity theory thus gives the constituents of matter an intrinsic dynamic aspect. It shows that the activity of matter is the very essence of its being. The objects of the sub-nuclear world are not only active by moving around very fast, they themselves are processes. The being of matter and its activity cannot be separated. They are but different aspects of the sub-nuclear space-time reality. "This fire is the fire of love for the Light of the splendour of His Face, which consumes all the determined forms and individual essences in the very midst of the ocean of knowledge of Allah and true life. And this true life is of such a nature that everything comes to life with it and yet is destroyed by it at the same time. There can be no greater bewilderment than the hayrah caused by the sight of drowning and burning with life and knowledge, and simultaneous self-annihilation and self-continuance." Let us return to the description of the physicist. He had outlined the new classical theory of how-it-is. He continued with a new model of particular interest to us for the features which we will immediately recognise. This is not offered as a proof, but as a clarification. The model about to be described is known as the Hedron bootstrap model. "The basis of the bootstrap model is the idea that nature cannot be reduced to fundamental entities, like fundamental building blocks of matter, but has to be understood entirely through self-consistency. All of physics has to follow uniquely from the requirement that its components be consistent with one another and with themselves. This idea constitutes a radical departure from the traditional spirit of basic research in physics which had always been bent on finding the fundamental constituents of matter. 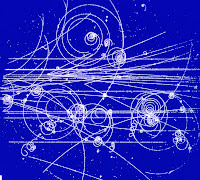 At the same time it is the culmination of the quantum mechanical conception of particles as an interconnected web of relations. But the bootstrap philosophy goes even further. It abandons not only the idea of fundamental building blocks of matter, but accepts no fundamental entities whatsoever – no fundamental laws, equation, or principles. The only requirement is that everything has to be self-consistent. The idea of the bootstrap model is that everything in the Universe is connected to everything else and no part of it is fundamental. The properties of any part are determined, not by some fundamental law, but by the properties of all the other parts. Therefore, in order to really understand any phenomenon we have to understand all the others. This is obviously impossible, and here physics and Eastern philosophy take different attitudes." What then is the picture of particles in the bootstrap model? 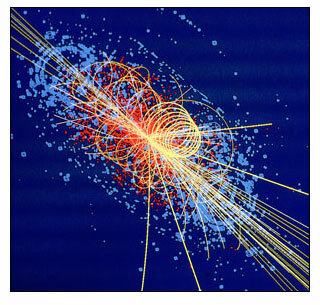 Well, it can be summed up in the provocative phrase: every particle consists of all other particles. Like all other scientific models, the bootstrap model can only be approximate, and its main approximation consists of the fact that it describes only certain kinds of particles, the so-called 'hedrons' or 'strongly interacting particles'. These are particles like the proton and the neutron which interact through strong nuclear force. In the bootstrap model, then, all hedrons are composite structures whose components are again hedrons. The essential feature of the model is the picture of the binding forces holding these structures together. The forces between the constituent particles are pictured as the exchange of other particles. This is a general feature of sub-nuclear physics: the forces between particles – i.e. their mutual attraction or repulsion – manifest themselves as the exchange of other particles. This concept is extremely hard to visualise. It is a consequence of the four-dimensional space/time character of the sub-nuclear world and neither our intuition nor our language can deal with this image very well, but it is crucial to the picture of the particles in the bootstrap model. The constituents which make up, for example, a proton, are particles, but the forces which hold them together are also particles, and therefore the distinction between the constituent particles and the particles representing the binding forces becomes blurred. The whole notion of an object consisting of constituent parts breaks down. Each hedron therefore plays three roles: it is a composite structure, it may be a constituent of another hedron, and it may be exchanged between constituents and thus constitute part of the forces holding the structure together. Each particle thus helps to generate other particles which in turn generate it. The whole set of hedrons generates itself this way, or 'pulls itself up by its own bootstraps', which is the origin of the model's name. 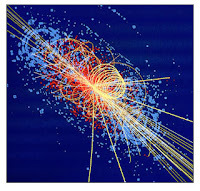 You will realise that this concept of every particle containing all other particles is extremely hard to visualise. This is because it is a relativistic concept. The hedrons are dynamic space/time patterns which do not contain one another, but rather 'involve' one another in a certain way which can be given a precise mathematical meaning, but cannot easily be expressed in words. The bootstrap model is a relativistic model of the inter-connected web of relations which I have mentioned before in connection with quantum mechanics. The universe exists on what is between the circumference and the dot, on ranks, and the smallness and greatness of their spheres. The one nearer to the circumference is wider than the one which is inside it, and so its day is larger, its place wider, and its tongue more eloquent. All things look at the point of their essences: and the point, despite its smallness, looks at every section of the circumference by its essence. So the epitome is the circumference, and its epitome is the point, and the opposite, so look! In 'The Seals of Wisdom' the Master is even more explicit. He says: Every particle of the world is from the whole of the world. That is – every single particle is capable of receiving into itself all the realities of all the single particles of the world. The Qutb Mudawi'l-Kulum also said: Man is the sum of all the 'flakes' of the world. And from man to everything in the world is a flake extending from that flake. There is nothing in the universe but that it has an effect in man, and man has an effect in it. And these flakes are light-rays-of-light. The focal point of this universal reality which is nothing else than an endless fulgurating display of light upon light is man, not just the species man, but man at his apogee, the Perfect Man, himself Light and knowing himself to be Light, Al-Insanu'l-Kamil. The word for man has a root NAS, meaning: 'to be shaken to and fro', 'to hang suspended': INSAN has a parallel meaning which is: 'the pupil of the eye'. Man himself is a vibrating whirling activity of energy in endless movement – he hangs suspended in the cosmos on his small planet, and in the Unseen he hangs suspended between the tremendous efflorations of form that make up the Fire and the Garden. At the same time he is the eye of the universe with which his Creator contemplates His creation. He is a gathering-together of all the forms, a resumé of the whole creational process from the basic matrices up through the elements and plants to the highest complexification of aspects. And so he is also a small universe, just as the universe from what the Qutb said above, is nothing else but Al-Insanu'l-Kabir, the Big Man. We are of course speaking here in the language of the Sufis and not in the language of ignorance and literalism. This does not lessen the veracity of the assigning to the cosmos the name of the Big Man, it is simply that literalist thinking is too primitive a method of reflection to grasp these matters. The Perfect Man is utterly aware and awake, permeated by all the Names and all the perfections of the Divine Attributes. * Is it a wave or a particle? * Scale of the Universe: Move the slider to view what amazing creation we are part of! Glory be to the Creator. 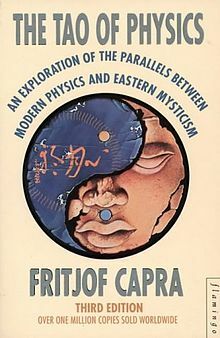 The Tao of Physics: Capra's first book, first published in 1975, challenges conventional wisdom by demonstrating striking parallels between oriental and greek mystical traditions and the discoveries of 20th century physics. It was originally published by a small publisher with no budget for promotion, but the book became bestseller by word of mouth before it was picked up by a major American publishing house.